Father William (Guglielmo) Lauriola grew up in the small town of Monte Sant’ Angelo, just 16 miles east of San Giovanni Rotondo. His parents owned a store which sold agricultural supplies and many other items. From time to time, one of the Brothers from Our Lady of Grace monastery in San Giovanni Rotondo would visit their store, asking for a donation for the needs of the Capuchin community. 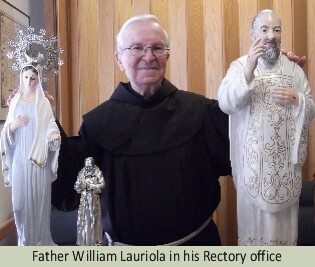 William’s parents were happy to help and they always asked for news about Padre Pio. As a young boy, William felt a great admiration for the Capuchin who visited their store. William decided that when he came of age, he too would like to enter a Religious Order so that he could dedicate his life to the Lord. The citizens of Monte Sant’ Angelo were aware that Padre Pio often sent people to their town, advising them to pray at the holy sanctuary of St. Michael the Archangel. They felt a sense of pride, knowing that Padre Pio held their town in the highest esteem. The angelic world was very real to Padre Pio, very present. His strong faith in angels was backed up by personal experience. He had been able to see and converse with his guardian angel since childhood. He always encouraged people to cultivate a devotion to the celestial beings, the angels. When William was a child, his parents used to take him by bus to San Giovanni Rotondo in order to see Padre Pio. Young William became so comfortable with Padre Pio that he would walk right up to him while he was hearing confessions and pull the white cord on his habit to let him know that he was waiting to greet him. After William graduated from high school, he sought admittance to the Friars Minor branch of the Franciscan Order and was accepted. Through the long years of study at the monastery of St. Matthew in San Marco in Lamis, he continued to make trips to the monastery of Our Lady of Grace in order to see Padre Pio. It was a cold winter day when William and his two companions met with Padre Pio in the monastery garden. Padre Pio motioned to the three young men to sit down on a nearby stone bench. No sooner had they sat down than they all jumped up in unison. Padre Pio was surprised. “But why did you all jump up so quickly?” Padre Pio asked. They explained that the bench was just too cold to sit on. Padre Pio then went into the monastery to get them some refreshments and soon came out with a basket of walnuts and some water. As it turned out, the two seminarians persevered in their priestly studies and were both ordained. Father William was ordained to the priesthood at the Franciscan monastery in Biccari, Italy in 1953. He continued to visit Padre Pio whenever he could. He was invited to have lunch at Our Lady of Grace monastery on a number of occasions. Pasta and vegetable soup was often the main meal of the day. Father William noticed that Padre Pio was the only Capuchin that never appeared to be hungry when the food was served. Father William was present once in the dining room when Padre Pio attempted to cut a large block of cheese with a very dull knife. He struggled with the task for a long time and could not seem to make any headway. Father William had the distinct impression that Padre Pio was simply trying to stall for time so that he would not have to eat his meal. To Padre Pio’s friends, his avoidance of food was always a mystery. Padre Pio’s life, in many ways, would always have elements of mystery. 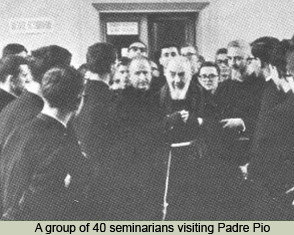 Once, in the sacristy of the church, Padre Pio was greeted by one of his spiritual sons, Dr. Pietro Melillo. When Padre Pio left the sacristy to go back to his cell, Pietro offered his arm in support, and walked with him down the hall. When they got to the door that led to the monks’ cells, they found that it was locked. “Did you bring a key for the door?” Padre Pio asked. Pietro replied that he did not have a key with him. Padre Pio then pressed his index finger against the door, and it opened instantly. At the time, it did not occur to Pietro that anything unusual had happened. However, a short time later, as he reflected on the events of the day, he realized with amazement, that Padre Pio had accomplished the impossible. He had opened a locked door with the simple touch of his finger. Father William remembers the first time the statue of Our Lady of Fatima came to San Giovanni Rotondo. The statue arrived in the back of a pick-up truck that was beautifully decorated with myriads of colorful flowers. Father William happened to be in San Giovanni Rotondo when the statue was leaving for its next destination, Monte Sant’ Angelo. Padre Pio’s eyes filled with tears as he bid his Heavenly Mother goodbye. Many years later, the statue of Our Lady of Fatima would arrive by helicopter and be greeted by even larger crowds throughout Italy. On one occasion, Padre Pio leaned momentarily out of the confessional and spoke to a woman who was standing nearby. “You must go outside at once!” he said. The woman obeyed him immediately. It happened to be snowing heavily on that particular day. In the distance, she heard someone crying for help. It was a poor woman who was struggling up the hill toward the church and was in great need of assistance. She quickly rushed to help the poor woman. On one occasion, Father William invited his niece, Immaculata (Ima), to take a trip with him to Pietrelcina, the town where Padre Pio was born and raised. In Pietrelcina, one could see many important landmarks of Padre Pio’s early life including the parish church of St. Anne’s where he was baptized, the small stone house at 32 Vico Storte Valle Street where he lived with his parents and four siblings, and La Torretta (the little tower), the small and secluded dwelling where he studied and prayed during his prolonged illnesses. Ima accepted her uncle’s invitation to visit Pietrelcina but she was somewhat aloof and distant regarding Padre Pio. Father William tried to reason with her. “Ima,” he said, “Padre Pio is truly the saint of our times. Do not doubt it.” As he spoke the words, the air suddenly became filled with a beautiful perfume. Ima was so struck by the experience that her attitude changed completely and she became very devoted to Padre Pio. Ima, who was a physician, began to pray to Padre Pio regularly for his intercession regarding the patients who were under her care at the hospital. Through the years, Father William has felt privileged to meet many people, both clergy and laity, who have inspired him by their great fidelity to God. One such person was his friend and fellow priest, Father Peter. Father Peter had to walk many miles to Father William’s parish in order to make his confession and he did so regularly. He continued to do so well past his 90th birthday. Once after hearing Father Peter’s confession, Father William said to him, “I want you to let me drive you home in the jeep today. It is such a long distance for you to walk. I know you may not like the idea but I insist on doing so.” “But Father,” Father Peter protested, “I do not mind the walk. Besides, penance is so good for us. It is so necessary for our souls!” One is also reminded that Padre Pio continually stressed the value of self-denial and penance. “Remember, we did not come into this world for a holiday,” Padre Pio said. Once, when Father William drove to Father Peter’s parish in order to pay him a visit, he was surprised to find that the doors to the church were wide open. The lights were on and the altar candles were lit. Everything was ready for the Mass to begin. However, Father Peter was nowhere to be found. As it turned out, Father Peter had felt ill on that particular day and realized that he would not be able to celebrate Mass. After making all the necessary preparations, he sat down in a chair and gently gave his soul back to God. When Father William learned that he was going to be sent to serve in the missions in Korea, he looked forward to the new assignment with great anticipation. Before he left Italy, Padre Pio gave him some words of advice. “If you are able to accomplish any good works in Korea, always remember to give the credit to God,” Padre Pio said. “It is the grace of God that brings success to all of our efforts. Never attribute anything to yourself.” The missionary vocation had always been close to Padre Pio’s heart. As a young priest, he had volunteered to serve in the foreign missions but his request was denied. His health was considered to be too fragile to stand up to the demands of missionary life. Father William was studying for a doctorate degree in theology at the Gregorian University in Rome when he got word that Padre Pio was very ill. The year was 1968. At the time, Father William was preparing for an important examination at the University. He told his professor that he had to leave at once for San Giovanni Rotondo. He explained that Padre Pio’s condition was grave, and he felt an urgency to visit him. He was aware that missing the test could set him back six months or more in completing his course of studies, but it could not be helped. He needed to be with his spiritual father. St. Margaret Mary Alacoque said, “We must make our life a continual preparation for the moment of our death and do all the good we can while there is still time.” Padre Pio had prayed often to St. Joseph for the grace of a happy death. He died peacefully and very well prepared in the early morning hours on September 23, 1968. In the church of Our Lady of Grace, Father William stood beside his coffin and gazed for the last time at his beloved friend. He was present at Padre Pio’s funeral, by far the largest in San Giovanni Rotondo’s history. It was estimated that 150,000 people attended the solemn funeral Mass. Today, 2012, Father William is pastor emeritus at the Immaculate Conception chapel in San Francisco, where he has served for the last 43 years. At eighty-five years of age, he remains remarkably active. His ministry includes pastoral counseling, baptisms, weddings, Rosary vigils, funerals, house blessings, visits to the sick of his parish, and much more. He has two secretaries who assist him and he rarely takes a day off. He is the spiritual director for the Our Lady of Fatima devotions, the Padre Pio prayer group, the Divine Mercy prayer group and the Holy Family prayer group. After Mass on the first Sunday of each month, Father William leads special prayers for the God the Father prayer community. On the second Sunday, prayers are said with the St. Peregrine prayer community, and on the third Sunday, prayers are said with the Rosa Mystica prayer community. Father William still loves to teach Scripture and Catechism and for many years he has served as one of the exorcists for the archdiocese of San Francisco. It was a blessing for us to meet Father William Lauriola and to visit his beautiful Immaculate Conception chapel. We were inspired by his kindness and his deep humility. Truly, we were blessed to meet him. “In 1958 I was able to make a trip to Rome to visit the Holy Father, Pope Pius XII. Three other priests from my diocese in Philadelphia accompanied me on the trip. We felt very blessed because, along with about fifteen other people, we were able to have a private audience with the Holy Father. I felt a great sense of the Holy Spirit when we were in the presence of Pope Pius XII. He had such a profound and tangible spirituality. The priests who were with me, said that they felt the same way. We were convinced that we were truly in the presence of a saint. I brought him a gift, a zucchetta, which is the small hat the pope traditionally wears. I was delighted that he gave me his own zucchetta when I presented him with the gift. I treasured it as a relic. After that, we went to Padre Pio’s monastery in San Giovanni Rotondo. I did not know quite what to expect because at that time, I did not know that much about Padre Pio. I will say that if there were any doubts in my mind about Padre Pio, those doubts disappeared when I attended his Mass. The church was very crowded that day. When Padre Pio came in to the church, a hush fell over the congregation. It was so quiet during Mass that you could have heard a pin drop. His Mass was awe-inspiring. I was very close to the altar and I could see the blood from the wounds in his hands. It was glistening. I have always had a great devotion to the Virgin Mary, our Mother and our Queen. I got in the habit of pinning a Miraculous Medal to my shirt. When people looked at me or spoke to me, they couldn’t miss the medal on my shirt. I asked Padre Pio to pray for my special intention, which was to spread devotion to the Blessed Virgin Mary. He answered me and said, “Tutto cuore” (With all my heart). In 1963, I went to visit Padre Pio once again, this time with Joe Peterson. Joe was a postman who worked in the Bronx in New York. He made a trip to San Giovanni Rotondo every year on his vacation in order to see Padre Pio. Joe eventually moved to Cromwell, Connecticut where he had an apartment at the Holy Apostles Seminary. He often gave lectures on Padre Pio which were very well received.